In my opinion, regardless of what type of half court defense you play, you can’t be a great defensive team without being a great defensive conversion team so that you don’t allow easy baskets in transition. Here are a couple of conversion drills that you might consider adding to your defensive portion of your team’s drills book. 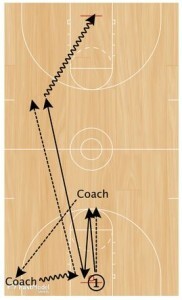 These drills came from Army Men’s Assistant Zak Boisvert’s PickandPop.net site. I have a link at the bottom of this post to the pdf that these two drills came from that show his 10 favorite defensive conversion drills. I have always called going from offense to defense “conversion” and going from defense to offense “transition” just to make our communication and teaching clear for our players. Two teams of 5 players line up 10 feet off the half court line facing each other. Coach is at mid court with the basketball. Coach can throw to either team. When a player catches the ball, his team attacks the defense. The player opposite the player who caught the ball must go touch the lane (giving the offense a 5 on 4 advantage, then convert back to defense. Red on Offense, Black on Defense. Defense has a 6th player at the opposite end under their offensive basket, simulating a rim runner. When black gets possession of the ball, they can throw the long pass to force red to sprint back to defense. You can put x6 on the wings if you are preparing for a team that throws ahead to the wing. You can also start off with only 4 black defenders and the 5th as the rim runner under the opposite basket. An excellent way to gain an advantage over an opponent is to gain an advantage of having (and cashing in on) more opportunities for easy (uncontested and/or close) shots. To gain an advantage over another team that could possibly be: 1) more athletic and talented, 2) quicker, 3) faster, 4) taller, 5) stronger, 6) has a deeper bench, or 7) a combination of any or all of the above; a team must maximize its number of easy shots while minimizing its opponents of the number of the same kind of shots. 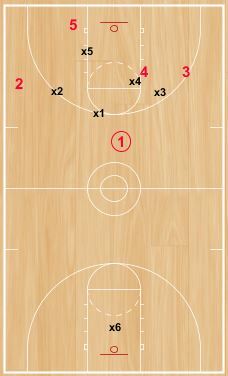 While half court offenses and defenses greatly affect the frequency of a team’s easy shots, and full court press defenses and offenses contribute to the number of shots also; a large portion of those shots can and will be determined by the facet of the part of the game that takes place between the actual time that a team is on defense and when that same is on offense. That gap between the offense and the defense is the transition between those two parts. The purpose of this transition time between your defense and your offense is to create as many “easy shots” as possible, while the purpose of our transition time between your offense and your defense is to minimize the number of easy shots that your opponents can get. 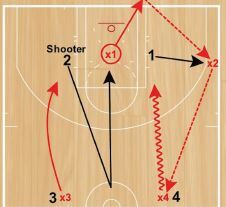 We define “easy shots” for a team as shots that are uncontested to some degree, a shot that is relatively close to the basket, and that when the shot is taken, the shooting team has a varying numerical and/or position advantage of their personnel over the opposing teams’ individual personnel. We define “offensive transition” as converting originally from defense to our offensive game. This type of transition leads US to our easy shots by our offense. Refer back to our definition of “easy shots” in the Introduction. This transition from defense to offense could actually initiate from various situations, such as: 1) capitalizing on a ‘live’ turnover by the opponents such as our interception of a bad pass, a recovery of an opponents’ fumble, a deflection or a loose ball on the floor, or their blocked shot, 2) causing and/or capitalizing a turnover violation with us having to take the ball out of bounds to initiate our ‘offensive transition’, or 3) our securing of a defensive rebound after an opponents’ missed shot, (obviously our defense helps determine how many missed shots our opponents have in a game) and 4) last, but not least (but sometimes forgotten), our immediate reaction and securing possession of the ball after our opponents have scored via field goals or free throws. We believe in an immediate and quick-reacting four-pronged attack. The first phase is actually our that is attempting to create a change of the basketball. The second phase is what we called the Primary Fastbreak. If the opposing team successfully defends the Primary Break, we smoothly and instantly flow into our third phase — the Secondary Break. If the opposing defense is fortunate enough to prevent our scoring from the third phase, our half-court continuity offense fluidly transcends from the Secondary Break. 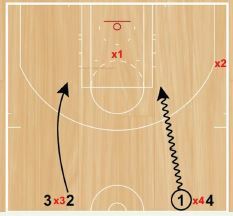 If run properly, our Primary Break into our Secondary Break into our Continuity Half-Court Offense seems to be an old inclusive organized system of continual motion (but orchestrated with specific goals and objectives). Still, regardless of how good your team’s defenses are and how fundamentally and structurally sound your Primary and Secondary Breaks are, and how solid your half court offensive continuities are, there is a distinct ‘gap’ between your defense and your offense. The smaller the ‘gap time’ is, the more successful your team will be in its “Offensive Transition Game.” The quicker that all five defenders respond and react to the change of possession, and become a “5 part offensive machine,” the more successful your “Offensive Transition Game” is. What a tremendous way for any team to gain an advantage over its opponent. Conversely to “Offensive Transition,” we define “Defensive Transition” as converting from our offensive game to our defense. The main objective of our Defensive Transition is to minimize the amount of time that our defensive system is susceptible to failure, because of a lack of the number of personnel and their proper positioning. Just as we want to maximize the numbers of easy shots that our Offensive Transition can produce, we want our Defensive Transition to minimize the number of ‘easy shots’ that our opponents can get. To put it simply, the more (easy shots) we get, and the less (easy shots) that opponents get, the greater the chance we have to win. By continually using Offensive Transition to initiate all or the majority of your offensive team work in practice, you create the good habit of quickly converting from defense to offense. One good routine to incorporate in full court scrimmages is to do the following. Often times, do not stop portions of your scrimmages to instruct or correct. This takes away from the number of transition opportunities that present itself. In a full court scrimmage, if there is a dead ball situation (after a rules violation) allow both teams to take the ball out of bounds as quickly as possible without having pseudo-officials administering the ball (and therefore slow down the ‘gap’ time. Have players use scrimmages to get into the habit of greatly stepping up the pace of both offensive as well as defensive transition. Make sure this is worked on in more than just full court scrimmages. 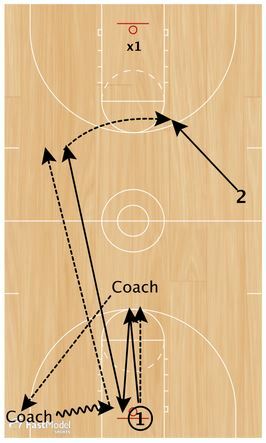 If you want to concentrate on working mainly on half court offense, start the work on the opposite end of the court in a semi-controlled defensive scenario, where the ‘2nd team’ starts on offense and voluntarily (on the coach’s command) surrenders possession of the ball by shooting, throwing the ball away (both inbounds or out-of-bounds). 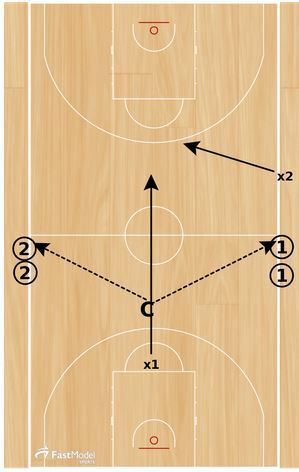 If you want to concentrate your work on the 4th and final phase–half court continuity offense, instruct your groups to run the Primary and Secondary Breaks, looking for the good shot opportunities. But have them only see them, recognize them, and pass them up; so that the team can concentrate on the selected phase to improve on–half court offense continuity. Obviously, if the coaching staff decides to work on the Primary or the Secondary Break, that wish is simply passed on to the squads; and the main squad still starts out in the 1st phase–Defense. Keep in mind that the first phase should be practiced in many variations. Examples of these variations that should be practiced, developed, and improved upon are: 1) Every full court defense you plan on using, 2) Every half court defense that will be utilized, 3) Different Defensive Baseline Out-of-Bounds Situations, 4) Different Defensive Sideline Out-of-Bounds Situations, 5) Opponents’ FT Shooting Situations, and 6) after your opponents have scored a FG or FT. The philosophies and concepts behind the Defensive Transition Drills are identical to the Offensive Transition Drills, but in an converse manner. With that statement in mind, we have gone a step further to become somewhat unique in our way of thinking. Most everyone has a Primary Fastbreak with particular concepts and ideas about running designated fastbreak lanes, located on the court. Since everyone (including all opponents) share that traditional and standard offensive philosophy, we have developed similar concepts and theories on defensive to attempt to counter opponents offensive fastbreaks. We call this scheme our Defensive Fastbreak. This idea is to simply have our perimeter defenders “get out and run the wide lanes” with the opponents’ offensive perimeter personnel. We expect our post defenders to sprint back to defend our interior after they have realized we have surrendered possession of the ball. Running the lanes congests them and also challenges all advancements of the ball down the court, either by means of outlet passes or dribbling. Slowing down our opponents progress while hustling back to defend our goal AND close proximity to the goal helps reduce opponents’ “easy shots;” which is our ultimate goal. 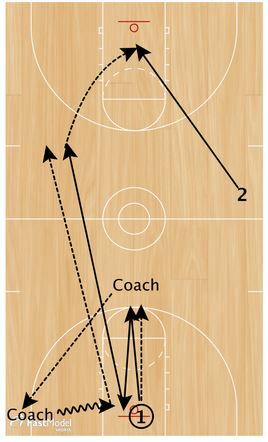 This drill was posted on the FastModel Sports Basketball Plays and Drills Library. The site has thousands of drills and plays that have been submitted by basketball coaches from around the world. Place a cone at the feet throw line extended at the opposite end of the court. The offense can’t cut in towards the basket until after they reach that cone, which allows the defense a bit more time to catch up and avoids collisions at mid court. The defensive player works to track down the offensive player and make a play on the ball. It is important that players do not get out of control during this drill, and that they never hit one of their teammates while in the air…we don’t want anyone getting injured. Instead, the defender needs to work on doing one of the following: sprinting in front of the offensive player; knocking the ball out from behind; blocking the shot from behind; or catching up completely and working to stop further penetration. The Coach tosses the ball off the backboard and Player 1 grabs the rebound. Player 1 outlets the ball to Player 2. Players 2 attacks the far basket as hard as they can and Player 1 sprints to catch up. Player 2 must wait until they reach the cone on the far end before cutting in towards the basket. Contributed by Fabian Mckenzie Cape Breton University Women’s Basketball. Offensive Players line up at half court line. X2 lines up whereever the coach wishes to create different angles and timing. X1 lines up at opposite free throw line. Coach throws the ball to one of the offensive lines. X2 comes in to stop ball, X1 comes in as trailer to become help defense. 1 for a score. – 2 for a stop or Turnover. Too much time on offense = TO (Coach decides what is too much time). play for 2-3 min each. Could also make this a live 2 on 2 in opposite direction after score or stop. This drill was submitted to the FastModel Sports Basketball Plays and Drills Library by Tim Springer, Girls Varsity Basketball Coach at Castle Hills First Baptist School. I hope that you can use this or add some more defensive wrinkles to include some defense and transition to your spring and summer “Improvement Season” workouts. You could also include 10 or 15 seconds of imaginary defense where the player has to simulate defensive positioning sliding, helping, etc… before transitioning to offense. Great drill to get players reps in different defensive situations and then transition into offense. Players passes to coach and closes out. Coach passes to corner coach and player drops into help. Coach drives and player walls up. Coach throws ball down court for player to chase down and score. Progression: 2 player break if you have a second player involved in the workout. Progression: Add a defender for a 2 on 1 situation if you have a third player in the workout. 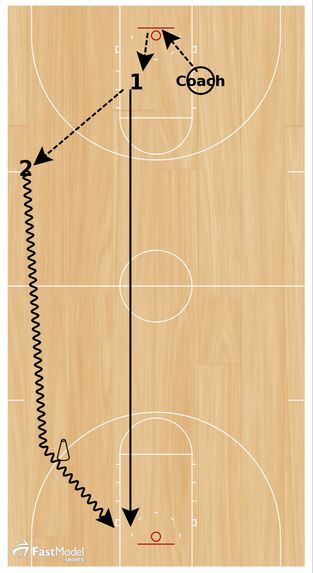 This transition drill is from Drew Hanlen’s Transition Drill Book. Drew is an NBA Strategic Skills Coach & Consultant that has helped over 25 NBA and NBA pre-draft players. Drew is the Head Skills Coach for Pure Sweat Basketball. He has run his internationally renowned Elite Skills Clinics in over 30 states and 4 countries over the past several years. Players will be divided into two teams. One player from the Red Team will start in the paint on defense and another player from the Red Team will start on the angle, as an outlet. Two players from the Black Team will start at half-court with the basketball. have as many teams of two as you want, but make sure there are an even amount of Black Team groups and Red Team groups. Offensive players will attack the defender and try to score in the 2v1 situation. Offensive players are allowed two passes to attempt a shot. One shot per possession. Offensive player that shoots (or turns the ball over) must sprint and touch inside the center circle, and then sprint back on defense, while the defender must secure the rebound or get the made field goal out of the net and then outlet the basketball to their teammate at the angle. If the defender gets a steal, they can quickly outlet the basketball to their teammate at the angle as well. As soon as the player receives the outlet, they will advance the basketball to their teammates that are ready to attack at half-court. The offensive player that did not shoot will rotate to the outlet line at the angle. Continue this rotation until one of the teams scores 12 baskets. How Progressive is Your Team’s Offense? Here are 3 ideas for drills to work on conditioning at the same time that you are working on skill development at a quick game-like pace. All three drills are scored and timed. The best way for you to implement them with your team is to determine how long your team can go and what type of score you want to set as your standard. You can always run the drills a few times and tweak them so that they are meaningful to your team. The videos are You Tube video so make sure that you are on a server that allows You Tube access. 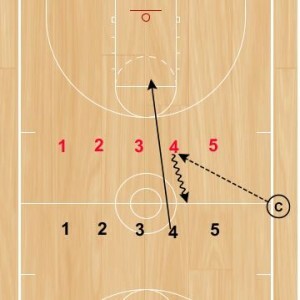 Make sure your sound is on and click the play arrow to see the videos of the drills below. The Goal for the drill is 120 in 4 minutes and 15 seconds. You can experiment with the amount of time that you run the drill for and whether you count each basket as 1 or if you want to count 1 for a layup and 2 or 3 for jump shots. Three shots are taken at each end. The goal for this drill is to make 28 layups with one basketball in two minutes. Drill requires players to make 85 layups in two minutes.